I recently chalked up a welcome to Summer on the screened porch, and even added a little more to the mix this time with some paper fans and pinwheels. Abby and I worked on this together, whipping up some flair with wrapping papers and hot glue and tape and whatever else we could find to get the stuff to stay on the wall. Just a little reminder that Summer won’t last long, so make some memories that will. And by all means, live it up! **Update: At reader Kathy’s request, I’ve made a printable of this art for you. It’s an odd size, but click here to download and adjust the size to make it work for you! This entry was posted in Uncategorized and tagged Chalkboards, Screened Porch, Summer. Bookmark the permalink. Follow any comments here with the RSS feed for this post. Post a comment or leave a trackback: Trackback URL. Super cute! Would love something like that for our porch! Hi! 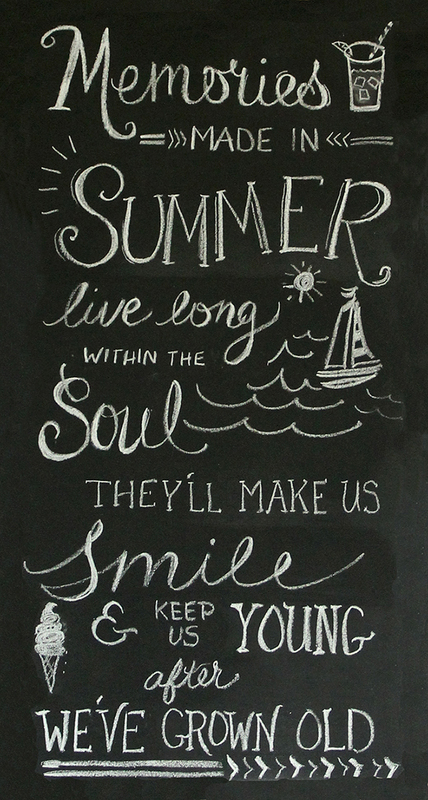 Do you have a chalkboard printable of the above chalkboard print thatI could download and blow up for a frame? I've just converted it to a printable for you & added the link within the post above. Hope it works for you! Enjoy!